Heading out of Melaka, we stop for a big bag of one of our favorite palm sugar vehicles, kuih keria. 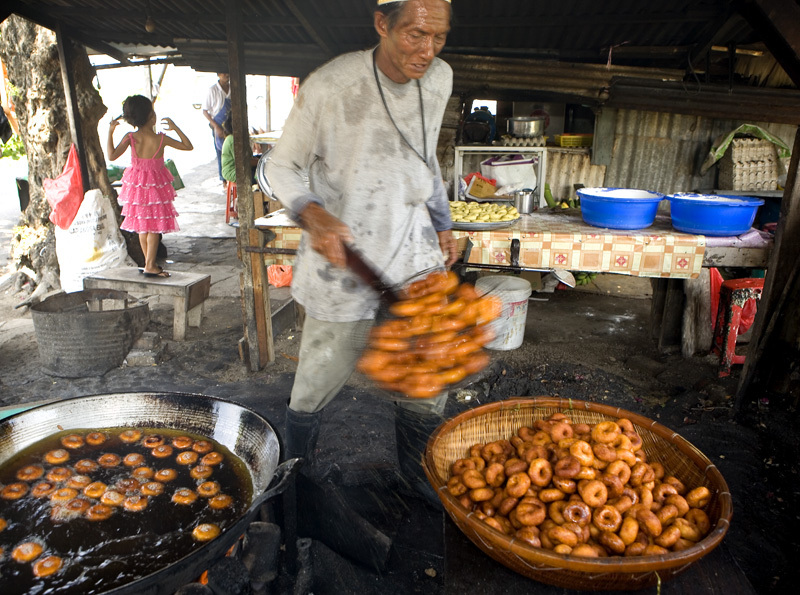 As Dave waits in the car I order two cups of kelapa muda (young coconut juice) and, in anticipation of one and a half hours of joyful on-the-road piggery, 20 of the tasty palm sugar-coated sweet potato donuts to go. Horrors! They won't be available till 2:30. It's 1:30 now and we need to get back in KL. Dejectedly sipping a kelapa muda, I walk back to the car and deliver the news. Dave is devastated. We've both been looking forward to this all weekend. Ten minutes up the road Dave makes a sudden U-turn. Schedule be damned - we're going back to wait it out. And are we ever glad we did. 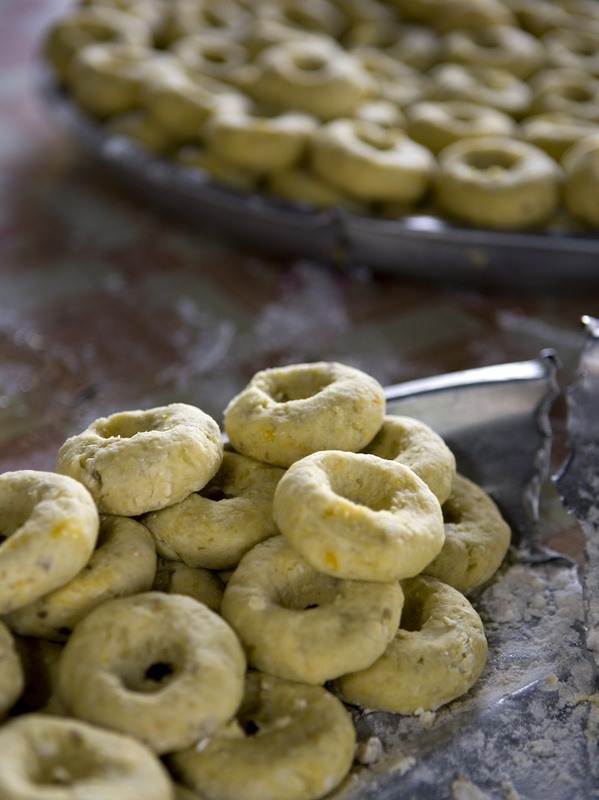 There is nothing, simply nothing in this world, like a freshly made kuih keria. 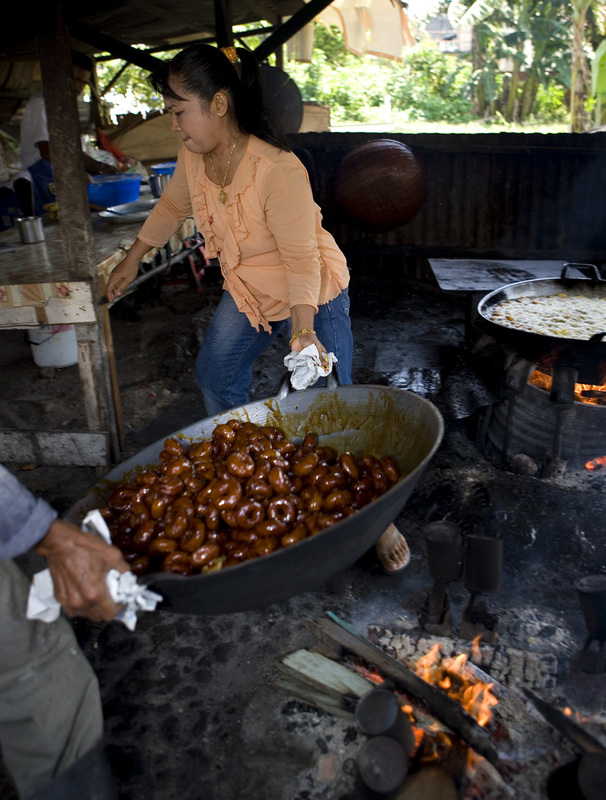 The donuts are made on-site in a tin-roofed, open-aired 'workshop' just behind the stall. 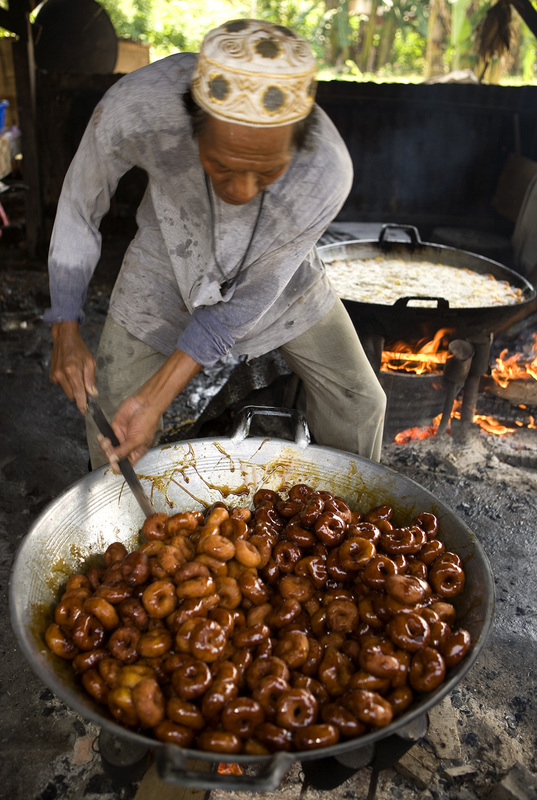 There we find the owner of the operation, an intense, wiry man, overseeing two massive wood-fired woks, one filled with bubbling oil and dozens of bobbing donuts, and the other with reducing gula Melaka syrup. While he's waiting for the first batch of kuih to finish frying he helps his daughter churn out more. They're both masterful donut makers, using only their hands to transform lumps of sweet potato dough into plump, even rings in seconds. 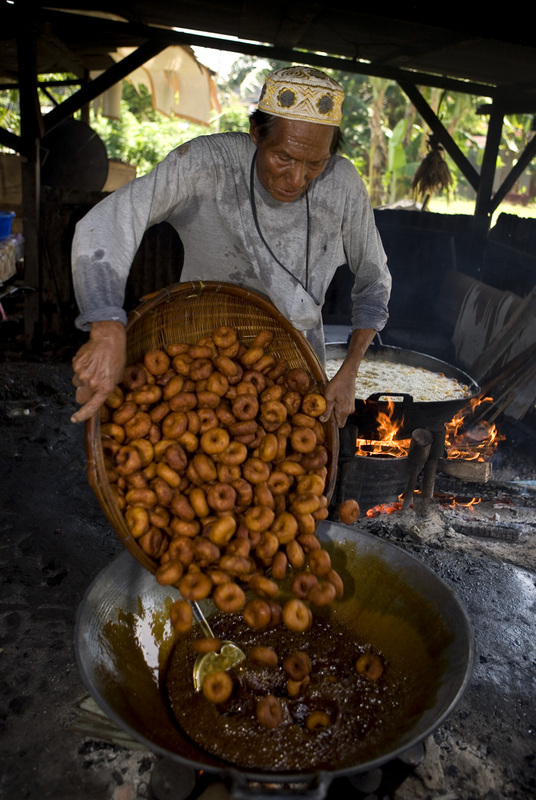 When the donuts have browned to the shade of cinnamon he scoops them from the oil and transfers them to a basket to drain and cool. The next batch goes into the oil. By now we're in a cloud of aromas simultaneously wonderous and maddening. 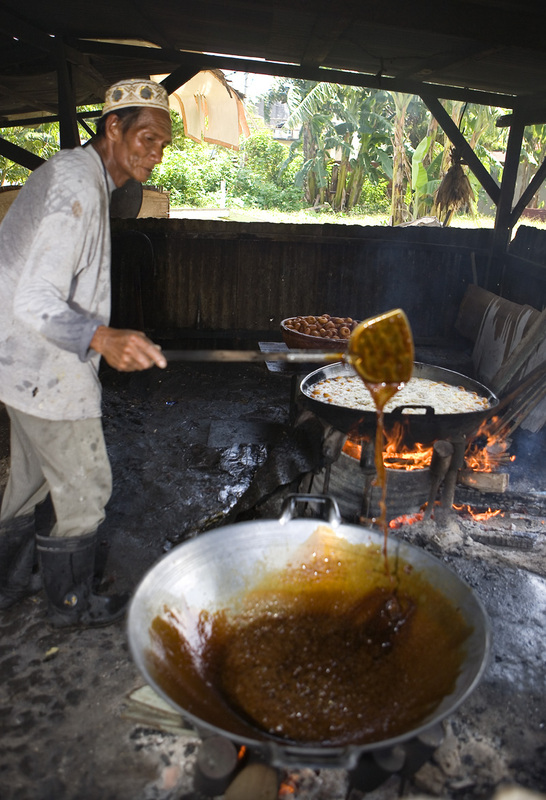 The smell of freshly fried dough intermingles with the sweet smokiness of gula Melaka, and it's nearly unbearable. 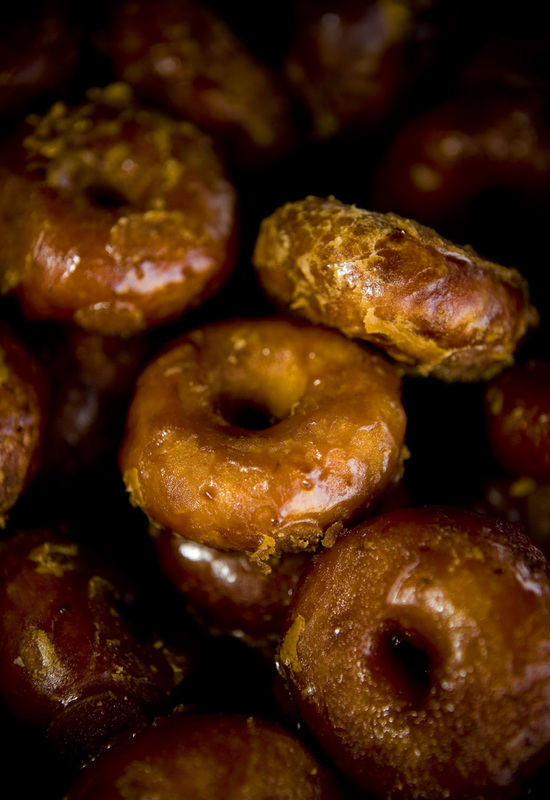 Drop the donuts in the gula already! we want to scream. But no. He returns to his lump of sweet potato dough and commences more donut shaping. 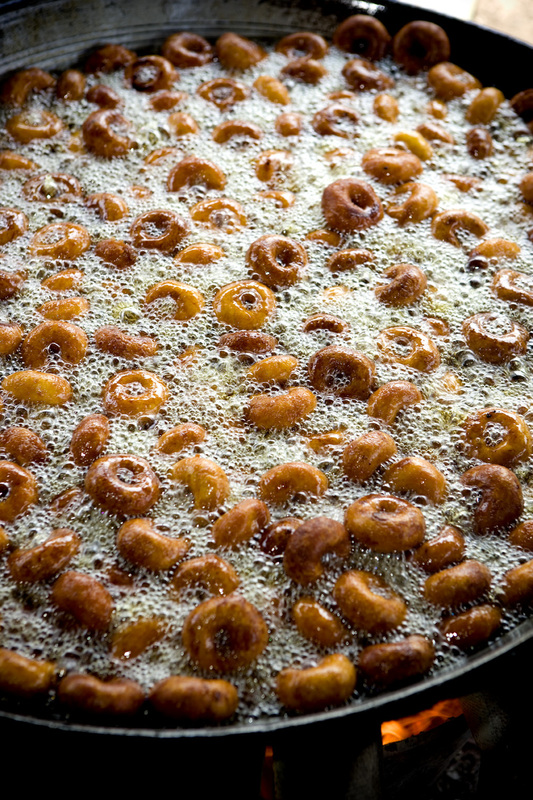 Every so often he walks over to the pan of gula syrup, gives it a stir, lift the spatula high to gage its thickness, and then lightly touches one of the crisped donuts to test its temperature. We watch. And wait. Finally it's time to add the donuts to the sugar. He puts them all in at once and begins turning the rings in the syrup, working quickly to coat them all before the sugar hardens. We now understand why he waited so long to add the kuih to the sugar - they must be cool enough to bring down the temperature of the gula so that it solidifies and clings. 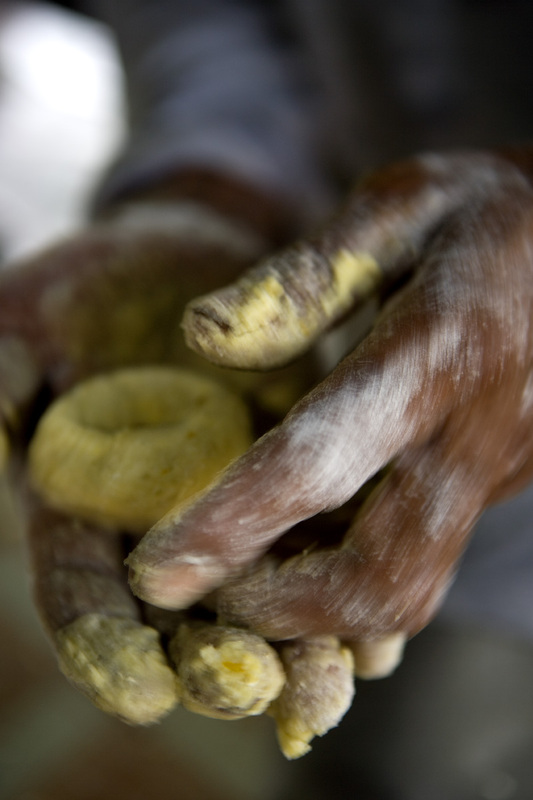 Watching this process makes us appreciate kuih keria even more. It's a real art and timing is everything. and then crouch beside it, tonging the donuts out to a platter one-by-one. Again, time is of the essence -the kuih must be pulled out of the pan quickly so they don't stick, either to it or to each other. At long last the first batch of kuih keria is ready for streetside sale. We up our order from 20 to 25; as soon as our bag's been filled cars begin stopping in front of the stall, their occupants ordering kuih keria by the dozens. When we get to our car we each eat 3 right off (they're too hot to eat directly out of the bag, but a few seconds in front of an air-con vent takes care of that) and continue gobbling at regular intervals all the way back to KL. 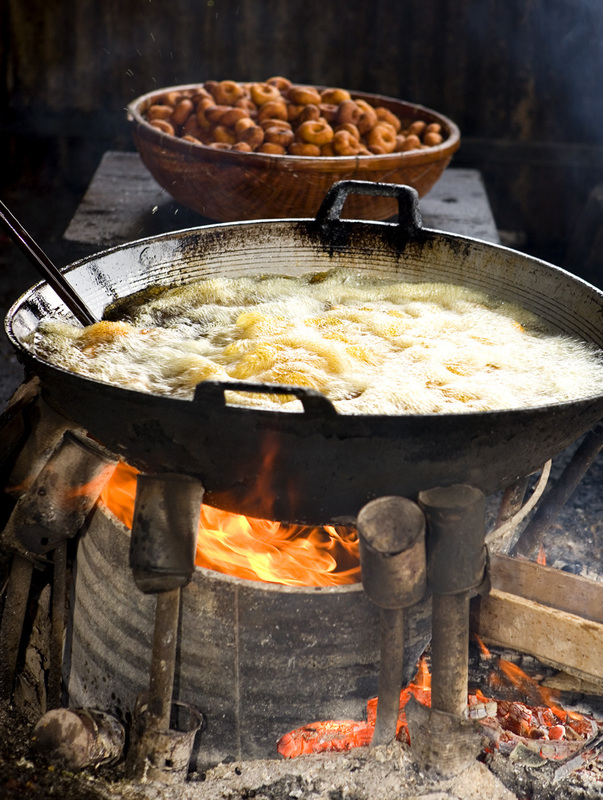 While Malaysia is home to many divine deep-fried snacks, the majority become decreasingly delicious the longer they're out of the fryer. 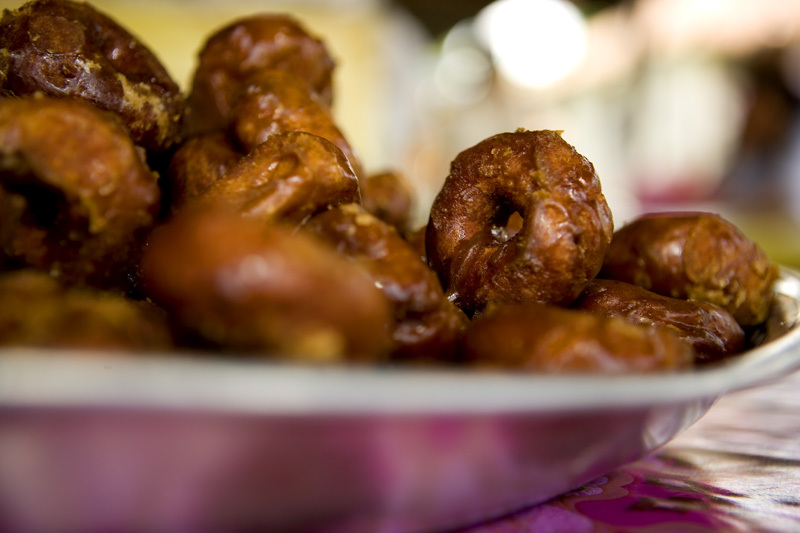 Kuih keria miraculously stand the test of time. To justify our piggery we engage in a bit of scientific observation. 2:35 Fresh, almost prohibitively hot. Inside soft and tender, almost melting and creamy. Nice flavor, can almost taste sweet potato. 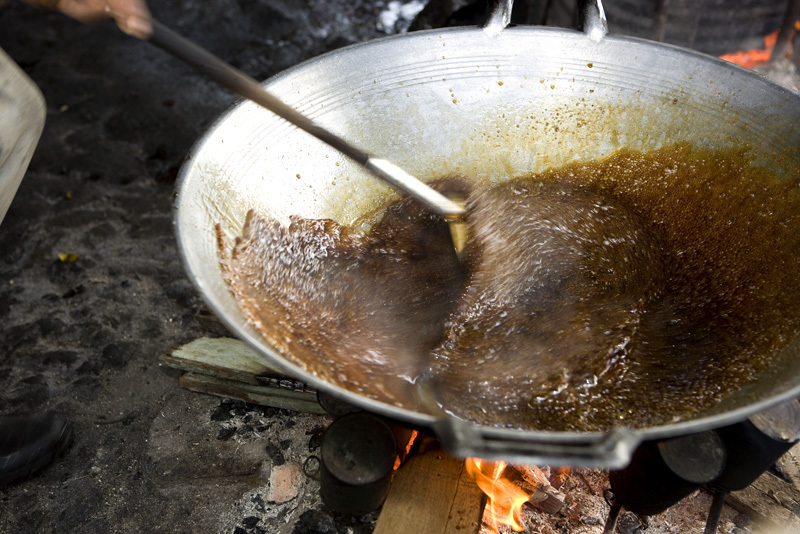 Intense gula flavor, with smokiness from wood fire and sugar. Outside firm but not at all crisp. 3:05 Inside still warm but not hot. Still very soft. Outside a bit firm, almost crackly, but gula clinging well. 3:50 Completely cooled. Inside firmer, chewy, more cakey. Creaminess almost gone but as flavor of dough has receded gula stronger, more smoky, with that lightly bitter and almost salty aftertaste that's the mark of a high quality palm sugar. Kuih Keria Antarabangsa, Jalan Tengkera (follow Jalan Tun Tan Cheng Lock till it turns into Jalan Tengkera - as if you're heading to the old trunk road to Kuala Lumpur - the stall is on your right), Melaka. 130-730pm, closed Friday. Also selling goreng pisang (fried bananas), kuih bidaran (sesame seed-coated deep-fried balls filled with sweet mashed mung bean), and deep-fried ubi balls. Oh my god. Worth the wait! Especially since it allowed you to document that amazing process. I'd be happy to help you in your research and tell you how they stand up to overseas shipping. How did the donutmakers respond to your taking photos? Did you ask first? Or chat, then ask? Or just start shooting? crunchasaurus - yeah, they use tons of gula and it's really really good gula. These are just the best kuih keria every. kitt - that's very generous of you! :-) I do know they're excellent the next day. If folks aren't immediately obviously wanting to have their processes (and themselves) photographed Dave always asks. I wouldn't say that these folks were as happy about it as some are, but they weren't unhappy either. Mostly they were just really busy and in cases like that Dave tries to stay out of the way as much as possible. Also, they knew that I'd gone away disappointed to be too early for kuih keria, so I think they were flattered that we came back and were willing to wait around. Jolly good Dave for making a U-turn and enlightened us with more pictures of the gula Melaka doughnuts. Jalan Tengkera .... must make a note. Hadn't had one of those kuih keria for ages and I guess the gula melaka does make a different. Silly question but if I may ask? Any comparison with the chain of doughnut stores from the States or KL (no name in case of libel)? mk - bite your tongue! no comparison at all. it's like comparing a fine British farmhouse cheddar with Kraft singles. Looks oh so fatteningly delicious! woo..... i must so visit this place. There used to be a stall selling these and the same other fried stuff a block behind my old house when I was a teen. I haven't had kuih keria more recently and now you've just given me a flavor craving that I have to follow up on. And I've never had them coated in gula melaka, only sugar so yours looks greatly better than the best I've had. Again, too far away....sigh. I guess I'll have to make a batch for myself just to satisfy the craving for now...I'm sure it won't be as good. That is one sweaty man! I wonder constantly if the rest of Southeast Asia has been "margarinized" like the Philippines. These days all the Mexican-influenced bakery breads have it, as do some rice cakes which are supposed to have butter. I'd rather eat animal fat (though I am vegetarian). It pretty much stops me from enjoying a lot of good street sweet baked or fried snacks. Catherine, Beth, offspring - really, really tasty. As good as they look. Annie - I'd think not, unless you can get some very good gula Melaka. Yes, I've only seen them sold in KL tossed in white sugar. Tasty, but not nearly as special. The white sugar doesn't melt and glaze them. B- I love that word, margarinized. Yes, Malaysia has been. It's everywhere. Even hamburgers are cooked in it! When people say 'butter' they usually mean margarine. Malaysians even cook hamburgers in the stuff! I just can't stand the taste of it though. holy smokes! those look absolutely sinful! i've never tried kuih keria coated with gula melaka. definitely gonna try this whenever i'm back home. Oh my. Honestly, you two have a knack for utterly and completely bringing a foodie experience alive both in images and in words. I've been a huge fan of your blog for a long while but this post is one of my favourites! Thank you so much! These look amazing! I'm definitely going to look out for them on my next visit to Malacca. Jln Tengkera is quite a long stretch of road. Heading north towards KL on the trunk road, is this on the left hand side of the road or on the right hand side? Looking at the pictures, it appears to be outside of the town area, almost around where Klebang beach is. Any landmark I should be looking out for or are these guys right by the roadside? I'm a regular visitor to Malacca and have not come across them b4. Thanks for the tip! I grew up and schooled in Malacca before leaving for and settling down in KL in 1974. It was only 2 years ago that I was introduced to this fantastic kueh keria by a friend who lived down that road (Jalan Limbongan). Nowadays, it is a compulsory visit to this stall everytime I "balik kampung" visiting my mum. I have only just read your blog entry and now I'm craving for some! Wonderful write-up and great pictures! Keep it up! Thank you! Chris - if you're heading north out of town the stall is on your right, opposite the 'beach' (or what's left of it). Hi Tedin - You're welcome. It's been way too long since we last enjoyed these. This is the best. Blog posting. Ever. Finally made it to Malacca over the New Year holidays. Your directions are spot on! We went there on consecutive days. Nothing beats eating them fresh on the spot. I had some cold for breakfast the next day and they were pretty good still. Thanks once again for blogging this! I've been drooling over this post off-and-on for about 2 years! Finally making it over to Malacca for a weekend - it sounds like a doable taxi ride out (taking the bus to and from KL - the driver probably won't be too amenable to a pit stop, haha)? Hi Ashley - Thanks for reminding me, with your comment, that we need to get back down to Malacca for these! Caveat -- I don't know if they are still open and operational. But if they are pay attention to timing -- too early they won't be selling and too late they'll be sold out. Yes it's a doable cab ride, really just about 10 mins from downtown heritage area ie Hereen House etc. Good luck! Have some for me. Thanks Robyn - If they're open, I'm pretty sure I'll be eating enough for a small village!